Judge Paul Egly, founding dean of the University of La Verne College of Law, died on June 26 at his residence in Laguna Beach. He was 97. Judge Egly’s life was extraordinary. As a World War II veteran, he began studying the law in post-war France and Germany. When he returned to the states, he earned his law degree at George Washington School of Law in 1949. Fresh out of law school, Judge Egly returned to Germany from 1949 to 1951, where he was instrumental in the prosecution of WWII criminals, including high-ranking Nazi officials. Judge Egly traveled home to America and started his own practice in California in 1952. By 1963, he was appointed to the Municipal Court by Gov. Pat Brown and then later in the same year, the Superior Court of Los Angeles by Gov. Ronald Reagan. During his time as a judge, he gained national notoriety for his spotlight role overseeing the suit Crawford v. Board of Education in which he fought tirelessly and often thanklessly, to desegregate schools in Los Angeles. Despite the fierce opposition and hostile criticism Judge Egly faced during this time, he remained focused on the thousands of minority children affected by the unlawful segregation and subsequent rulings. “He risked his own financial stability, and despite the political shrapnel that would result, he did the right thing,” said Dean McVay, past president of the Western San Bernardino Bar Association and College of Law adjunct professor, who walked Judge Egly down the aisle at his final commencement ceremony. In the midst of the Los Angeles desegregation suit, which spanned almost 20 years, Judge Egly took on desegregating San Bernardino schools as well, turning to magnet schools to incentivize parents to send their children to public schools that offered specialized programs. In 1970, Judge Egly, with a passion for education, founded the University of La Verne College of Law, serving as professor of constitutional law and founding dean. What began as a small state-accredited law center evolved into much more after Judge Egly raised the funds for a dedicated law library. The University of La Verne College of Law received full accreditation from the American Bar Association in 2016. 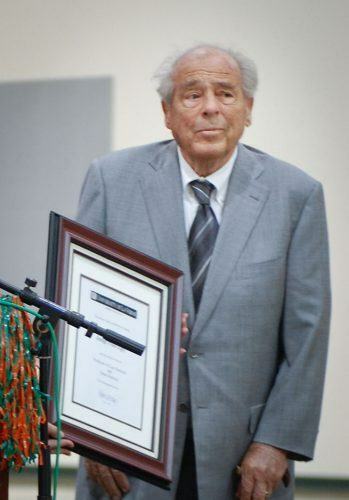 “I got to know him well into his retirement years,” said University of La Verne President Devorah Lieberman. “He was in a wheelchair and visually impaired at that point but he was sharp and funny. He was clearly very proud,” Lieberman said. “He had a dream that ULV would become an accredited law school recognized by the American Bar Association and in 2016, that’s exactly what happened. He planted the seed and his dream for the University of La Verne became a reality,” she said. At 62, Judge Egly lost his eyesight to macular degeneration but despite the challenge, he continued teaching, his passion for the law and commitment to education unwavering. ULV College of Law alumna Christine Thielo, a family law attorney, taught as an adjunct professor at ULV and is currently running her own practice, Thielo Law. During her time as a student, Judge Egly taught her in a hands-on Civil Procedure Practicum course. “He was very sink or swim. He was blind, he was a judge, a dean, a professor – he had a strong work ethic and required the same of his students,” she said. Thielo said that, at the time, the area where the College of Law was built was bereft of reputable law schools, and that in a very real way Judge Egly was responsible for an entire generation of lawyers that currently serve our neighbors and friends in La Verne and the state of California. Not only is Judge Egly responsible for jump-starting the careers of a vast community of lawyers in our area, but well-respected judges too. Superior Court Judge Teresa S. Bennett, a ULV graduate, met Judge Egly in the 1980s when her friend windsurfed into his boat. She started working full-time as Judge Egly’s driver, which sparked her curiosity in the law. “If it weren’t for Judge Egly, I would never be where I am today. He encouraged me, sprouted my wings and sent me on my way,” Bennett said. Judge Egly’s legacy is one that inspires courage, fight, and commitment. Emily J. Sullivan can be reached at emily.sullivan@laverne.edu.